Amazing 125 US gallon/500 liter reef aquarium is an awesome display of hard and soft corals with a variety of marine vegetation. Lighting consists of one 5600° K, 175 watt metal halide lamp and two actinic 03 lamps. Filtration is accomplished by having two large protein skimmers feed a trickle filter with three cu. ft. of Super BI OX®. This magnificent display is 100% Marine Environment® dual phase formula. 15% water changes are made every two weeks. MARINE VITA-PEP and MARINE GREEN are added every two weeks between water changes. Pro: Internet parties can access a large amount of information about specific subjects of interest to them. Con: It is sometimes difficult to access the relative quality of information. Pro: Many friendly intelligent humorous people may be encountered in chat rooms. Con: A few people in chat rooms are idiots. Pro: Some very intelligent questions are posed and answered leading to further intelligent questions and answers. Con: Some very simple questions are posed and answers posed again and again and again. Pro: Sub-adults utilize computer technology and make their parents proud. Con: Snerts exhibit sub-intelligence and provide a valid argument for birth control. As for www.aquacraft.net the information offered is from a wide variety of professional and independent sources. In most cases, this information is the culmination of decades of diligent work. We offer no opinions. Only facts. We report. You decide. In the last issue of “Take the Heat” I described a self proclaimed Internet aqua-guru that offered statements and ‘opinions‘ that reflected his less than GED mentality. Apparently, he offended the majority of others in the chat room with a variety of other remarks. He was singled out in a friendly aol chat room ballot as “Jerk of The Year 1999”. When he received word of his… award, he was very upset. He told the chat room “…goodbye.” But, like a revenue agent or nasty rash, he will not go away. The latest performances by the same individual defy intelligence. Within a few days of his return, he stated in the aol Pets Fish chat room the following… 1)”Sea horses are the most difficult fish to keep.” When I read this I though of a 13 year old that is currently breeding sea horses. 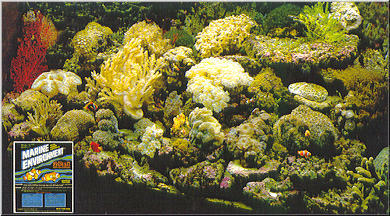 2) He then admitted to over dosing his reef tank with Tropic Marin® calcium and his aquarium water was now milky. This is a classic example of misinformation that is offered by wannabe’s on the net.